My alarm went off just before 4 am. It was another early start for another long drive and long hike. I ate breakfast and then gathered all of my gear. Once everything was loaded into my car I set my GPS and headed out into the quiet darkness; it was 4:40 am. About 15 minutes into my drive I realized I had forgotten my battery bank for my phone. I use my phone as my GPS track unit, so having enough battery is important. However, I was far enough away I did not want to turn back and lose the time. My phone has a large battery and I thought I could make it last if I was careful and did not turn on the screen too often. After stopping for gas in Bath, NY, I arrived at my destination at 7:08 am. I pulled on my socks and boots, shouldered my pack and camera, and grabbed my walking stick. Once my phone GPS app was running I made a mental note to avoid unnecessary checking of the phone (mile 0.0 – 7:14 am). I left Camp Road and headed through a tractor path to a field. The grass in the field was tall and wet with dew. I waded through the grass along the edge of the field and came to a turn that took me into the woods. A short distance into the woods I came to a trail register and signed in. The light was still low, clouds obscured the sun, and the air was cool. I came to the edge of a field, the trail passed by continuing in the woods and not entering the field. A nice view could be seen from the edge of the field and I detoured to take a few pictures before continuing on. After following along outside the field the trail turned and opened into a small field. The grasses were deep and, like the first field, covered in dew. I waded through as water beaded on my boots and ran down my legs. It was a short walk across the field, but I could feel a little water beginning to seep into my boots; my boots are waterproof, but they have seen a lot of miles. I entered a hedgerow on the other side of the field, passed through, and came to another field. This field was in use. It had been tilled and plants were growing in rows low to the ground. I guessed that the plants might be potatoes. I made my way along the edge of the field, the tilled earth making it difficult to walk because of the uneven ground. Some tall grasses had grown up along the edge and I had to wade through. As I waded through I felt sharp pinches at my ankles, the grass had hidden small pricker bushes. The white blazes led me along the edge of the field and around to the left. I passed through a narrow hedge and into another field also tilled and planted with the same crop. At the other side of the field I entered another hedgerow and turned to my right for a short distance. I turned back to the left and entered another small field. This field was tall with grass like the first, and wet. I waded through feeling more water seeping into my boots. On the other side I entered a short section of woods before coming out into yet another field, again with tall, wet grass. The path followed along the curve of Sixtown Creek which ran to my right and sat about 15 – 20 feet below the level of the field. I made my way along above the creek and through the field and passed through another hedgerow and into still another field. This field, like many of the others, was tall with wet grass. However, a section of the field had been planted with what appeared to be pumpkin plants. A pair of fake owls stood guard on perches above the plants. I stopped to take a few pictures of the creek and of the pumpkin patch and its guards before wading on. The trail turned to the right continuing to follow the bend of the creek and passed into a lightly wooded section for a short distance. Once again I came to another field and waded across, my socks now damp. On the other side I came to a small tractor path through the woods. I followed it along and saw a piece of blue tubing hanging across the path ahead. I came to the tubing and ducked under it starting down a small incline (mile 2.0 – 8:08 am). Scanning the area ahead of me I found no white blazes. I turned back and found the blazes had taken the path on a sharp turn to the left. More blue tubing ran through the trees along the side of the path. Some of it looped around the trees and joined together in junctions feeding to larger tubing. I quickly realized that this was a large sugar maple farm. The blue tubing were tap lines that ran from the trees back to a central collection point. 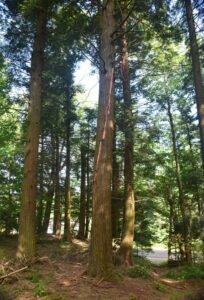 The tubing at the trees was small, but as it got closer to the central collection point it joined with larger and larger tubing. I made my way through the maple sugar farm. At points I had to step over or duck under the tubing. The tubing continued for quite some distance before I finally left it behind and the trail continued to wind through the woods. A short time later I came to Pond Road. I checked the battery level on my phone, it was still quite high and I estimated that I might have 40 – 50% battery left by the time I got back. A right turn onto Pond Road took me across a bridge over Sixtown Creek (mile 3.1 – 8:38 am). I paused to take a few pictures and then continued on. Just beyond the bridge I turned right onto Lapp Road and a few yards down that road I turned left onto Rice Road. I made my way up Rice Road past a few houses and then between two fields. The trail turned left off the road and crossed one the fields (mile 3.5 – 8:47 am). A sign at the trailhead listed destinations ahead and behind me and their distances. Another sign indicated that the trail section was closed from Oct 1 – Dec 22. I made my way across the field and passed through a narrow hedgerow into another field. This one was full of Christmas trees. The trail turned to the right and continued along the edge of the field before entering the woods at the back. Upon entering the woods it turned sharply to the left and continued on. I found myself on a well-defined path and soon was lost in thought. After a short distance I realized that I had not seen a white blaze recently. I back-tracked about 500 yards and found that the trail had turned right and left the well-defined path I was on (mile 4.4 – 9:18 am). A short distance beyond the turn a sparkling object on the ground caught my eye. 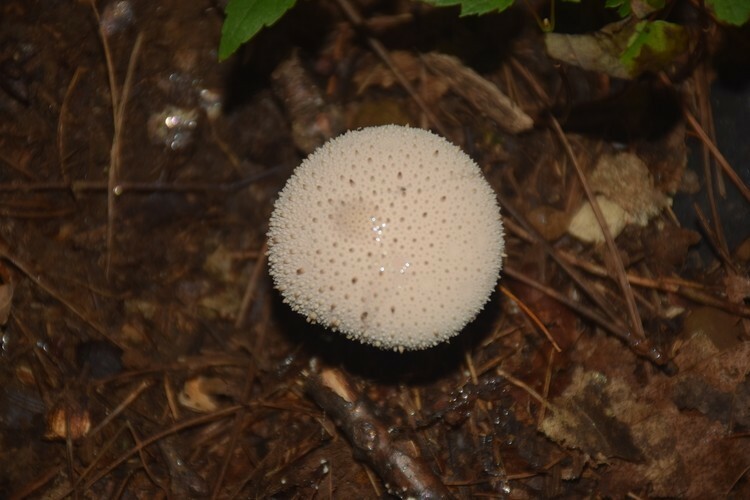 It was a mushroom. I took a few pictures and then continued on. A short time later a clearing on my left opened up and I saw a cell tower rising into the sky. I took a few pictures of the tower and noticed a bright orange clump of mushrooms hanging on the side of an old log nearby. A few more pictures of this mushroom and then I continued on. I arrived at NY 19 and turned left heading down the road (mile 5.2 – 9:40 am). A short walk later I came to the intersection of CR 3. The sun was finally starting to break through the clouds as I snapped a few pictures before continuing on. As has been my habit since I began hiking the FLT, I write down the road names and distance between each on a piece of paper. I had 0.5 miles of road-walk on CR 3 before reaching my next turn. I arrived at the designated point and saw some faded white blazes on a tree pointing down a small dirt track leading to Sixtown Creek (mile 5.8 – 9:51 am). At the edge of the creek I scanned the other side looking for the next white blaze. After many seconds of searching I had found nothing. Reluctantly I pulled out my phone and opened the digital map I had purchased from the FLT. The map showed that the trail continued on up CR 3 for some distance. It seemed that the tracking spreadsheet I use to write the note was out of date and needed to be updated. I made my way back up to CR 3 feeling disappointed. 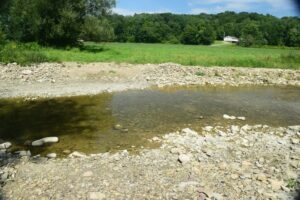 The old info had indicated that a hiker would need to “ford Sixtown Creek” and I was looking forward to wading across the cool water. I also am not a fan of road-walks and this looked to be a long walk. It was, 1.5 miles later I arrived at the trailhead (mile 7.3 – 10:19 am). A trail register hung on a tree just off the road and a large log lay on the ground nearby. It looked to be a great place for a break. After signing into the register I lowered my pack and sat down. I noticed a tall red pine tree nearby that had lost a section of bark in a spiral running down the tree; what I suspected was a lightning strike. After I finished my drink and snack I walked over to take a few pictures before heading up the trail. I continued on winding through the woods and soon came to Weaver Road (mile 8.5 – 10:58 am). White blazes directed me to the right on the road. I made my way down the road under bright sun between two freshly mowed fields. A short distance down the road I saw a pair of white blazes on a fence post directing me off the road to the left and across a small field. I walked up a small hill along the fence and entered the woods. A short distance after entering the woods I came to a tree fall blocking the trail (mile 8.8 – 11:06 am). I could see a white blaze in the middle of the clump of trees that had fallen over. The woods to the left (south) of the tree fall looked passable, so I picked my way around until I reached the other side of the tree fall. I turned back to take a picture and make note of the GPS coordinates to send to the FLT trail reports email later. As I took my picture I noticed what appeared to be a path around to the north side of the tree fall. I would check it on my way back. The trail continued on following a well-defined path through tall grass, weeds, and pricker bushes of all types. Some of the long tendrils of the pricker bushes reached out to snag at me as I walked through. After about 100 yards I had not seen a white blaze and I suspected I might have missed a turn. I back-tracked and found that the trail had turned at a water-logged spot. My focus had been on the ground and navigating around the large puddle and I had not noticed the blazes turning off. I continued picking my way along. There were numerous small branches down on the trail and I kicked and threw many to the side. It was difficult going at times. I arrived at another tree fall, and this time there was no path around. I picked my way around through a marshy area, stepping on fallen branches to keep from sinking into the mud and muck. Once I was on the other side I made note of the GPS coordinates once again before continuing on. A short distance after the tree fall I came to a sign for a blue spur trail (mile 9.5 – 11:27 am). The sign indicated that an old growth black cherry tree was 200 yards ahead. I decided to take the short detour to see the old growth . The blue-blazed spur was less traveled than the main white-blazed trail and was difficult to follow in places, but it was short and a few minutes later I arrived at the massive tree. I took several pictures before heading back to the main trail. I continued picking my way along the main trail, clearing branches as I went and arrived at another small tree fall. After picking my way around it I quickly came to another sign, this one for the Sixtown Creek Campsite. I considered checking it out, but I needed to press on; it was getting later and I still had a ways to go to reach my turn-around. Just past the campsite sign I entered the back of a field. I walked down along a hedgerow separating it from another field to my right. 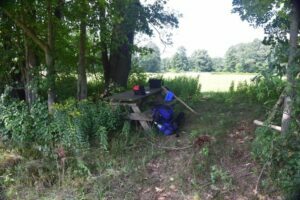 A picnic table had been placed in a clearing in the hedgerow and I thought this would be a good place to stop on my way back. A short distance past the picnic table I came to a pair of metal signs, one warned about Big Foot sightings in the area and the other welcomed me to Tangled Lights Christmas Trees. I looked around, but saw neither Big Foot nor Christmas trees. The trail continued on along a mowed path next to a small pasture holding a pair of cows. They stared at me from their enclosure as I walked down along the fence. 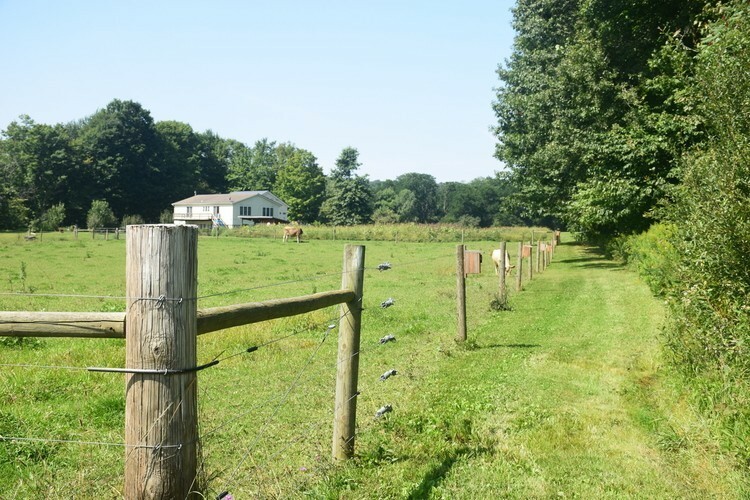 Beyond the pasture was a large garden next to a house. I walked on past the garden and out to Stickle Road (mile 10.0 – 11:46 am). A short walk down Stickle Road and I turned right off the road and followed the trail around the edge of a field. A very short walk later and I was descending to Higgins Road (mile 10.4 – 11:55 am). It was getting late and I need to pick up my pace. My turn-around time was no later than 1:30 pm and it was nearly noon. I made my way up Higgins Road under the bright sun. A long field bordered the road to my left and beyond it ran Sixtown Creek. Ahead of me I saw a mailbox and next to it a post with the FLT logo and an arrow pointing left across the field. I turned and crossed the field and arrived at the creek (mile 11.3 – 12:11 pm). After searching for a blaze on the opposite side I gave up and once again pulled out my phone and the digital map. The map indicated that the trail crossed the creek and continued on up the other side. I sat down, pulled my boots and socks off and walked into the cool water of the creek. It felt great! The water was only calf-deep and I was able to wade across easily. Once on the other side I sat down and pulled my socks and boots back on. 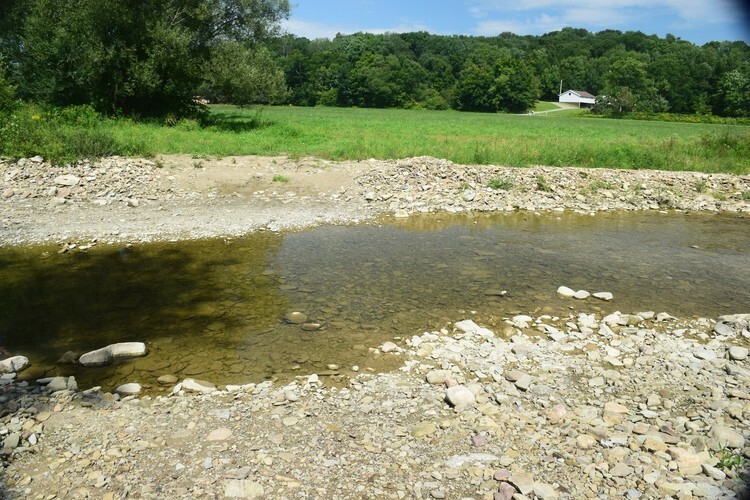 A wide dirt and gravel path led up from the creek to a field. Across the field I saw a bright white blaze on a tree. I plunged into the tall grass and waded across. The trail continued on into the woods climbing up a hill and winding its way through. Ahead of me lay Swift Hill State Forest . 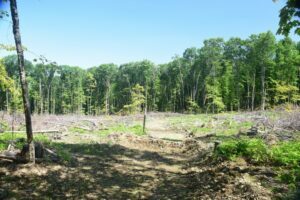 I had read a trail notice on the FLT website that the NYSDEC had closed the trail for up to three months beginning on May 14 for tree harvesting operations. My hope was that the operations were complete now and I could make my way past to Handcock Road, my turn-around. If I was unable to continue on through I would be close to my turn-around and would complete the section on my next hike. I came to the area and found it open and the blazes well marked (mile 12.5 – 12:40 pm). The area had been cleared of all but the smallest of trees. 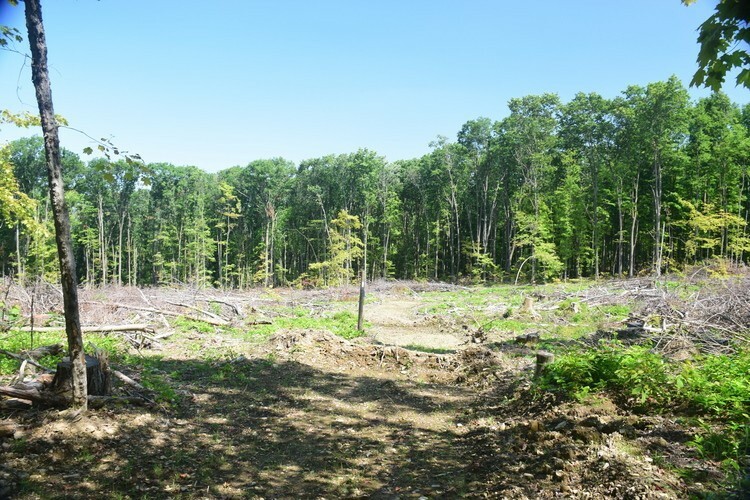 Many of the tree tops had been left on the ground to serve as breaks and good places for small animals to hide and build homes. Mounds of earth crossed the path periodically to prevent erosion and disperse water off to the side. I suspected that by this time next year briars would be quickly overgrowing the area. I made my way up through the clearing and then along a skid track that had been used by the equipment to clear and harvest the timber. A short time later I came to Handcock Road, my turn-around (mile 12.8 – 12:47 pm). I took a few pictures and then headed back down the track and through the cleared area. I arrived at the small field and crossed over to Sixtown Creek a short time later (mile 14.3 – 1:20 pm). Once again I removed my boots and socks. The water felt even better on my sore feet. As I crossed I stepped on a sharp rock and felt it dig into the bottom of my foot. I tried to shift my weight, but there was little I could do without losing my balance and falling into the water. Fortunately it didn’t cut me, but it still hurt. On the other side I sat down and decided to get a drink and rest for a few minutes. It was not a good spot for a long lunch break, it was right out in the bright sun, but it was nice for a short break. After a short rest I pulled out fresh socks and pulled my boots back on. I hung my old socks, still damp from earlier, through loops on the back of my pack. I made my way back across the field to Higgins Road (mile 14.5 – 1:35 pm) . The place on my foot where the rock had dug in stinging now and then. I turned down the road and a little while later I was climbing up the short path from Higgins Road to Stickle Road. After passing the house on Stickle Road I turned down the hedgerow, past the garden, small cow pasture, and two metal signs and arrived at the picnic table (mile 15.6 – 1:58 pm). I happily dropped my pack next to the table and got out my lunch. After eating and a nice rest break I set out once again. Ahead of me was the rough section with the tree falls. I picked my way around the first two tree falls and arrived at the first one I had encountered on my way out. I turned to the north side this time, finding a few strips of bright orange tape marking the path. It took me around to the other side easily. Once past the last tree fall I was soon walking down the small field next to Weaver Road and turning to my right down the road. I could see a farmer driving a tractor in the field across the road. I walked a short distance down the road and then back into the woods. A short time later I was back at the trail register near CR 3 and the lightning struck tree. 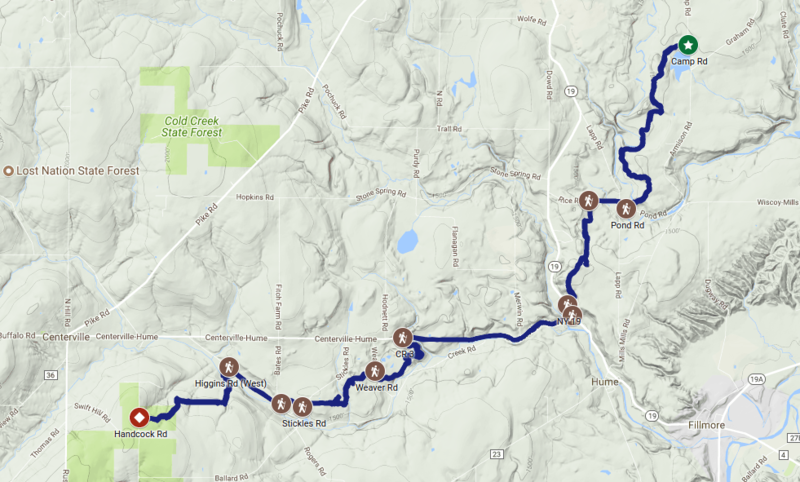 After signing the register again and taking a short break I set out on the long road walk down CR 3 (mile 17.9 3:22 pm). I trudged along the side of the road quickly as I could. The hard pavement under my feet allowed me to walk faster, but was unyielding and I felt every step. The road was busy enough I had to step to the side frequently and walk along the shoulder as cars whizzed past. Most of the walk down the road I just focused on moving forward. I kept up a steady pace; one..two..thee..four, one..two..three..four. Finally I found myself back at the intersection with NY 19 (mile 19.8 – 3:58 pm). I turned left for a short walk up NY 19 and the turned right off the road. The trail climbed up and passed by the cell tower and then past the sparkling mushrooms. Then I was back in the Christmas tree field and turning to cross the field along Rice Road. Since I had passed through the field earlier in the morning the tall grasses had been cut down and were laying out to dry. I quickly crossed the field and the turned right onto Rice Road (mile 21.4 – 4:38 pm). A short walk down the road I turned onto Lapp Road and then onto Pond Road. 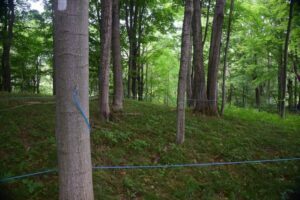 I left Pond Road behind and climbed up a small hill and soon found myself back among the blue tubing of the sugar maple farm. I made my way through the tubing and after leaving it behind arrived back at the pumpkin patch guarded by the pair of fake owls (mile 23.2 – 5:25 pm). The trail took me back across the numerous fields on my way to Camp Road. In the planted fields I discovered the nasty little pricker bushes that had torn at my ankles earlier. I stopped to take some pictures of the vicious looking thorns on the plants. I made sure to avoid them as I crossed the fields. Finally I had passed back through all but the last field near Camp Road and re-entered the woods. I resisted the urge to look at my phone to try and conserve battery. I arrived at the trail register near camp road and signed in again. Ahead I heard a loud whirring and churning noise and as I entered the last field I saw a large tractor heading away from me mowing down the tall grass. It had already passed along the edge of the field and I was able to make my way down without having to wade through the tall grass. A short walk down the edge of the field and I was back at my car (mile 24.88 – 6:10 pm). I checked my phone, my battery was at 19%. My earlier estimate had been overly optimistic, but I had made it. I pulled off my boots and socks and switch to my sandals. While I was changing a car slowed and stopped. The driver asked me if I had been fishing at the nearby pond and if I had had any luck. I told him I had been hiking and did not know if the fishing was good. After he pulled away I finished changing, started my car, and started home on my long drive. Amazing hike. Thanks for the details and photos. As usual you make it feel like I am on the trail. My Brothers run the family farm and make great maple syrup! Thanks for sharring your hike! That’s great Nancy. 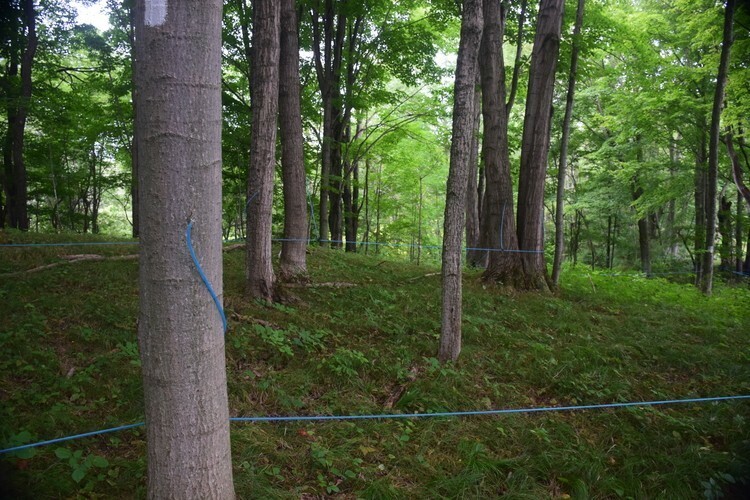 I knew, in a general sense, how maple syrup was harvested, but to actually see all the tap lines was pretty neat. You can’t beat real maple syrup! I also want to add a big thank you to your family for allowing the FLT to go across your land. Being able to see things like this, that so many people do not get to see or even know about, is one of the reasons I hike.